This review first appeared in the January 10, 1997 issue of the North County Times. Not only has the Cuban trade embargo failed to dislode Fidel Castro form power, but it's denied stateside listeners access to one of the richest musical communities on earth. One of the best young musicians on the Cuban scene would have to be 31-year-old flutist Orlando "Maraca" Valle, at least judging by a new disc he's recorded. A veteran of Irakere, the top-notch Cuban jazz ensemble, Valle plays flute with some serious attitude. 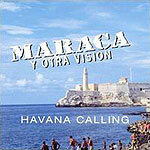 His band, Otra Vision, is a top-notch jazz dance band in the tradition of the great Cuban big bands of the 1920s-'50s. On slow ballads like "La Vela," the dreamy music reminds of Xavier Cugat or Desi Arnaz. But the band can also play more modern, jazz-infused styles along the lines of Irakere, or even pure American jazz. Maraca is a dynamite soloist, on par with other Irakere veterans like trumpeter Arturo Sandoval or saxophonist Paquito D'Rivera. His flute playing has Latin bite and spice, coupled to the extrapolative improvisation of the jazz tradition.